To ask questions or to make a reservaton, a phone call to us is best. There is a 15% HOLIDAY PREMIUM for ALL rentals from DECEMBER 15th thru JANUARY 6th. Thanksgiving week is at our regular Winter rates. All Cottages have 2-3 bedrooms, 1-2 bathrooms, fully equipped kitchens and a large family-style porch-type living/dining room. All units are fully screened and have ceiling fans in every room. Daily maid and cook service for one meal per day is included in the cottage rates, guests provide all groceries needed for meal preparation. 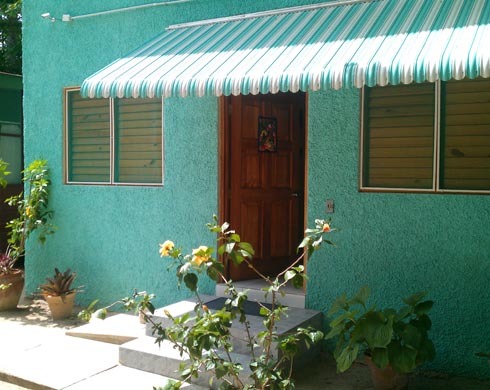 Cottage 1 has three bedrooms and accommodates up to six people. There is a full-bath in the cottage, and one full modern bathroom with an open-tiled shower right outside. We now have A/C in all of the bedrooms! Add $30/night year round for each additional person. 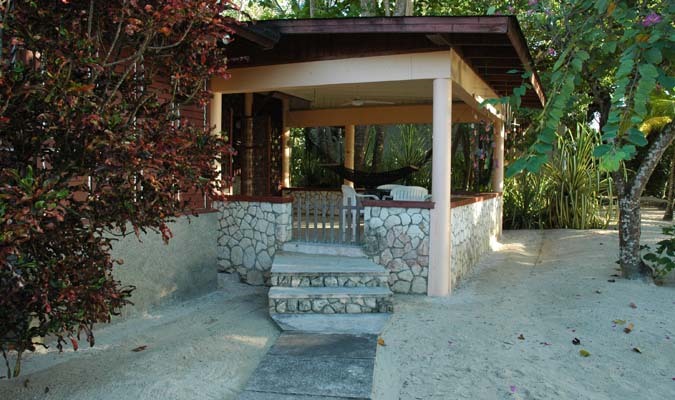 Cottage 2 is larger, and features three bedrooms, which can accommodate six people. There is one full bathroom in the cottage, and another full bathroom just outside. Cottages 3 & 4 can each accommodate four people. They feature two large bedrooms, one deluxe tiled bathroom inside, and a lovely open family room/kitchen. spacious living/dining area, and kitchen. It is our only unit designed with full handicapped access. Our Lovely GARDEN VIEW STUDIO'S are just steps to the Beach. Each air-conditioned unit has A/C, Ceiling Fans and a King Bed, a self-catering kitchenette with a sink, coffee maker, microwave, blender, toaster, fridge, and 2 burners. and the unit has screened louvered windows. and you can enjoy a view of the lush tropical gardens from your front porch. There is a sitting area with 2 reading chairs & a large walk in closet. There is an exceptionally large & artistically tiled walk-in shower and vanity in the bath area as well as a second sink & vanity in the separate toilet area. 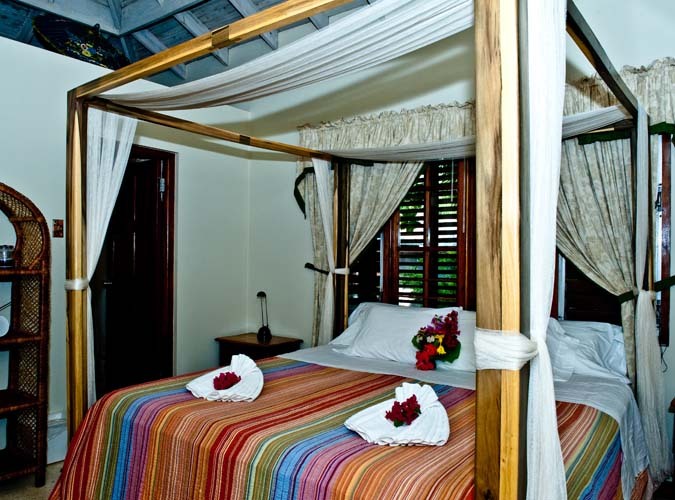 We also feature two special & elegant 1 BR VERANDA SUITES which have a romantic four-poster bamboo king-size bed with netting, a full kitchenette with a coffeemaker, blender, toaster, fridge, & 1 burner. The Veranda suites have an exotic outdoor shower as well as a lovely tile bathroom with another shower, a bidet, and a separate large his-and-hers dressing room. These are among the most spacious and luxurious air-conditioned suites in all of Negril.........you will fall in love with them. The romantic air-conditioned SUNDECK 1 STUDIO has a king-size bed in a lovely beachfront room with a fabulous ocean view & features a large open sun deck designed for total privacy. It has a nice tiled bathroom & a large walk-in closet. There is a brand new (self catering) kitchenette with a coffeemaker, blender, toaster, 2 burner hot plate and fridge. The ocean view is breathtaking, and it's all yours! You'll LOVE the romantic air-conditioned SUNDECK II STUDIO. This unit has a king-size bed in a lovely beachfront room that opens to a large covered sitting room that has an ocean view with total privacy from any neighbors. The fabulous deluxe and beachfront Owner's Villa! 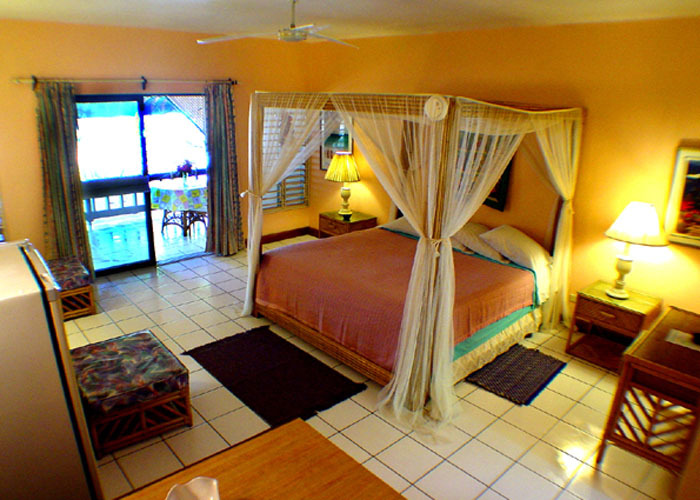 fully screened, with ceiling fans in every room. with a king-size bed and a louvered ocean view. The Owner's Villa has an exotic and lushly planted outdoor walled shower garden, a designer bathroom with a bidet and a second indoor shower. Featuring a large double sink vanity and a large his and hers walk-in dressing room/closet. There is a full kitchen with coffeemaker, blender, toaster, fridge, microwave, stove and sink. Cook service for 1 meal per day is included, guests provide all groceries. 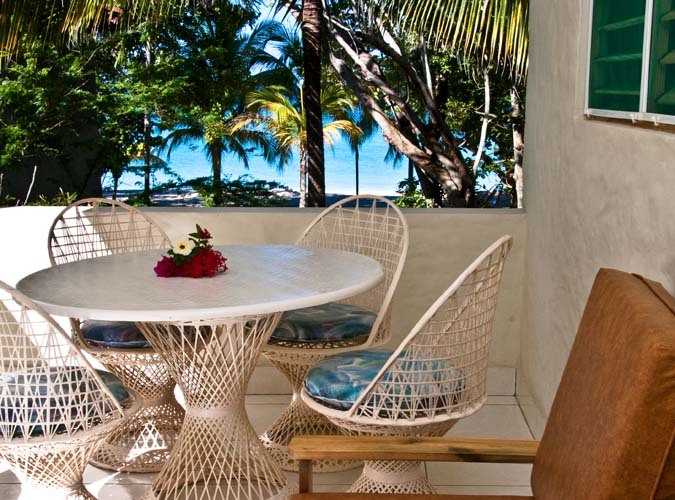 A large dining area and sitting room, plus a separate living room which opens out to a very large private open Veranda facing the ocean and the beach. It is furnished with a table, chairs, a hammock and a swing chair. Cable TV is included with the villa rental. 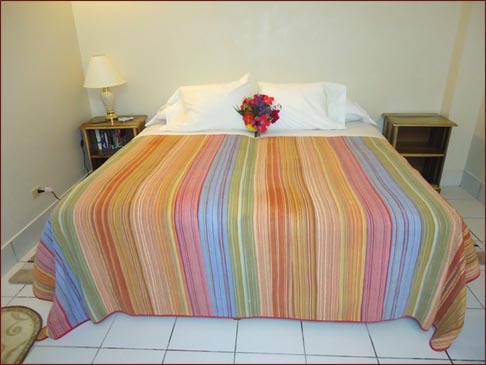 We add a 10.00% per dollar JA hotel tax to all rentals. Please add a 16.5% GCT tax and $7 per night/ per unit for the Jamaican room tax and energy surcharge..